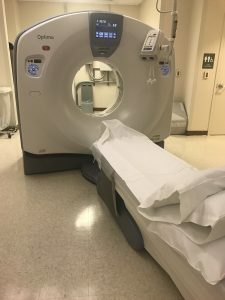 Sutter Amador Hospital welcomed a new 64-slice CT scanner to the hospital this week thanks to the generous support of the Mervin and Audrey Sheppard Trust. Hospital leaders, foundation members and family and close friends of the Sheppard’s gathered at the new unit for a ribbon-cutting ceremony and small reception to honor the occasion. Jody Boetzer, senior development officer at SAH and Shirley Bruns, niece of Mervin and Audrey Sheppard. Robert Hartmann, M.D., who cared for both Mervin and Audrey Sheppard for more than 25 years, spoke kindly of the couple and described how their generosity allows the hospital to provide state-of-the-art care to the community. 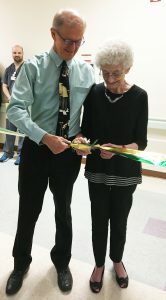 Dr. Hartmann and Shirley Bruns cut the ribbon for the new CT Scanner. 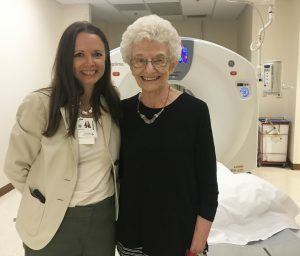 “The new CT scanner improves the quality and speed of our imaging technology and wouldn’t be possible without the Sheppard family,” said Sutter Amador Hospital CEO Anne Platt. The new GE Optima 660 Computed Tomography (CT) scanner replaces the hospital’s 16-slice CT scanner captures up to 64 simultaneous anatomical slices of 0.625 mm in a single rotation with more precise images of rapidly moving organs like the heart and lungs. It is also helpful examining patients who can’t hold their breath, such as trauma victims, young children and the extremely ill. Additionally, the new machine offers 3D surface rendering for orthopedics, colonography for cancer screenings, coronary angiography with radiation doses minimized for the size and age of our patients. The Sutter Amador Hospital diagnostic imaging team completes roughly 200 CT scans a month and is the certified primary stroke center in Amador County, the CT scanner will offer superior image quality for the diagnosis and treatment of a stroke and also to noninvasively detect blockages in the coronary arteries.